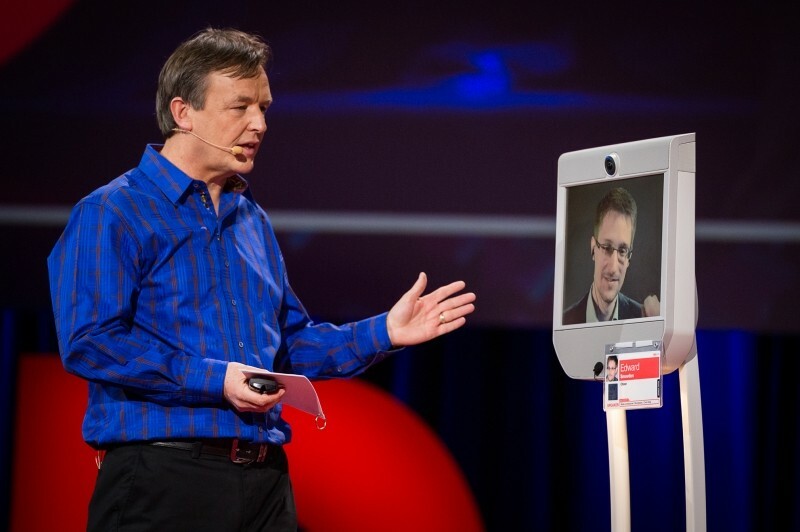 NSA whistleblower Edward Snowden made a surprise appearance at the TED Conference in Vancouver yesterday. Snowden didn't appear in person, as he is still in Russia where he has been granted asylum for one year, he spoke via a robotic mobile camera system from overseas. "I am living proof that an individual can go head to head with the most powerful intelligence agencies around the world — and win," Snowden said. Snowden was joined by chief of TED Chris Anderson and later, the father of the internet Tim Berners-Lee, to answer a number of questions on the state of the internet along with how Snowden is coping with his current situation. Based on a transcript of the talk, Snowden said that Americans who haven't done anything wrong should still be very concerned about the clandestine activities being perpetrated by various intelligence groups. "In democratic societies around the world, people should be able to pick up the phone, call family, send text messages to loved one, travel by train, buy an airline ticket — without wondering how those events will look to an agent of government, possibly not even your government but one years in the future," Snowden said. "Trusting any government authority with the entirety of human communications without any oversight is too great a temptation to be ignored. Snowden clearly has a target on his head right now, the American government wants to prosecute him for espionage and there is said to be various members of the intelligence community that want him dead. "It’s no mystery that there are governments that want to see me dead. I’ve been clear again and again and again, I go to sleep thinking about what I can do for the American people," Snowden explained to Anderson. "I don’t want to harm my government, I want to help them. But the fact that they are willing to completely ignore due process, they are willing to declare guilt without ever seeing a trial, these are things we need to work against as a society." While many want to quiet the former NSA analyst for good, according to reports of the TED event, the crowd erupted with applause when asked if Snowden made the right choice leaking private agency data. After being called on stage by Anderson, Tim Berners-Lee called Snowden a "hero." The talk continued with Snowden reiterating the idea that the NSA and agencies of this nature use terrorism as an excuse to spy on innocent civilians and that in a "post 9/11 era, they used secrecy and justification of terrorism to start programs in secret without asking Congress or the American people. Government behind closed doors is what we must guard against." Snowden also said there is still more revelations to come from the more than 1.7 million documents he acquired from the NSA, especially regarding the agency tricking corporations to open up back doors for them to syphon data through. The robotic mobile camera system used allowed Snowden to appear on a screen mounted on a robotic pedestal, allowing him to move freely on the stage and view the entire crowd from his location in Russia. It was Suitable Tech's Beam Bot Robot product, according to reports.